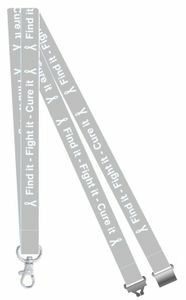 Our "Find it, Fight it, Cure it" Lung cancer awareness lanyards are a great way to raise awareness and show your support at all your events and fundraisers. Gray for Lung Cancer Awareness, each lanyard is printed on both sides for easy wearing and features a quick-release safety buckle. Perfect for trade shows, meetings and fundraising events too hold your ID, name badge or even your keys. 36 inches long and 5/8" wide. Make sure to check out all our Cancer Awareness Products.